Washington, DC – American Rivers today released its annual list of America’s Most Endangered Rivers®, identifying ten rivers facing imminent threats. This year’s report spotlights the threat that climate change poses to rivers, clean water supplies, public safety and communities nationwide. 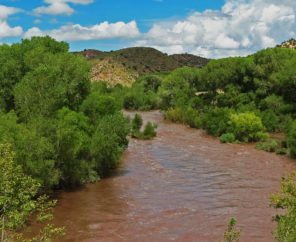 #1 Gila River – The Southwest is becoming hotter and drier due to climate change. Building a costly new diversion and compromising river health doesn’t make sense when there are cheaper, more effective water supply alternatives for the region. #3 Upper Mississippi River – Increased flooding is occurring throughout the Upper Mississippi basin due to climate change. Choking the river with new levees and traditional flood control structures threatens public safety by making flooding worse downstream. In its 34th year, the annual America’s Most Endangered Rivers® report is a list of rivers at a crossroads, where key decisions in the coming months will determine the rivers’ fates. Rivers are chosen for the list based on the following criteria: 1) The magnitude of the threat; 2) The significance of the river to people and nature; and 3) A critical decision-point in the coming year. Over the years, the report has helped spur many successes including the removal of outdated dams and the prevention of harmful development and pollution. American Rivers believes every community in our country should have clean water and a healthy river. Since 1973, we have been protecting wild rivers, restoring damaged rivers and conserving clean water for people and nature. With headquarters in Washington, D.C., and offices across the country, we are the most effective river conservation organization in the United States, delivering solutions that will last for generations to come. Find your connections at AmericanRivers.org.